Through our long-term collaboration with world renown camera manufactures, we are able to integrate high quality PIV cameras into our systems. The choice of the camera itself strongly depends on your application and budget: For some tasks a more economical solution might be right choice, for others you absolutely need the latest components to succeed. We are also proud to present our own high-end cameras: The ILA.PIV.sCMOS and the ILA.PIV.Nano, both developed in collaboration with PCO. Together with our specialized ILACamWare, PIV Image Acquisition was never easier: Feel free to post-process raw data your own way (Although we strongly recommend using our software of course…), as images are saved directly to your hard disk. you are prepared for every PIV task at hand. To facilitate camera setup, our remote focus control (EOS Controller) is directly integrated: Adjust your Canon EF lens precisely via our intuitive software without touching your aligned camera anymore. 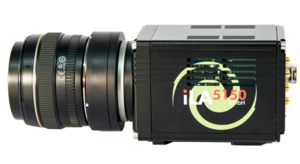 ILA.PIV.Nano is a compact size camera with one of the highest quantum efficiencies in the PIV branch. A compact camera head that can be integrated even into the smallest environments. are just some features when it comes to PIV measurements. In addition to its pocket size dimensions and high-end performance, it is situated in the lower price segment for scientific cameras, making it ideal for smaller budgets.